Another wonderful entry in the Dummies series! 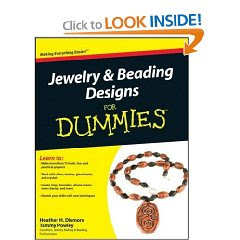 This one, Jewelry and Beading Designs for Dummies was co-written by Heather H Dismore and my friend Tammy Powley. Both have extensive experience with writing directions for beginner projects, making both simple and complicated steps clear. This book is a follow up to the original Jewelry Making and Beading for Dummies, so if you are a complete beginner, you will probably need this book first. The current book is focused more on designs and creating finished pieces, although they do cover many basic techniques quite thoroughly. There are hundreds of illustrations and photographs to help you as you stretch your skills and create all different types of beaded accessories using lots of different materials. Yes, there are projects as well as techniques, and they will help you master skills while you end up with lots of fun new wearables for yourself or for gifts.